I have big aspirations. Huge. Holiday break means time to conquer all those niggling tasks and projects that I never seem to get to during the week (dry cleaning, I'm looking at you) and a large chunk of them are technology related: transferring pictures and files from the old Dell to the Mac, updating software, etc. In addition, I'm developing the Shana Speaks Wine webpage (you heard it here first!) as well as working on an upcoming event. But, as it seems to go with all things tech, things are gonna get ugly before they get better. After a phone session with an Apple technician that left my laptop (and my mood) in worse condition than when I began, it felt like the right time to try a Cote du Rhone that I recently brought home. On the nose, this 60% Grenache/40% Syrah blend showcased traditional notes of black cherry, raspberry and green and red bell peppers, along with some red licorice. The first sip was a little tannic and astringent, but mellowed out after a few minutes in the glass. Sipping through, the same flavor profiles from the nose were present on the palate, but there was much more black pepper and spiciness on the tongue. 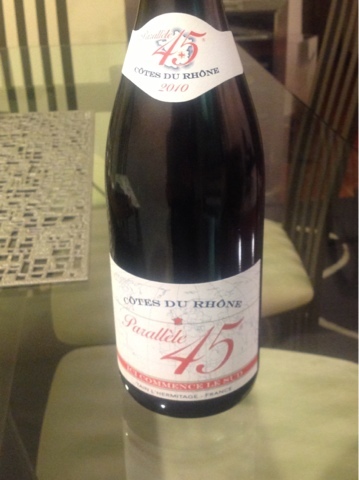 It was more medium-bodied than other Cote du Rhones but by no means was full-bodied. This is a great value wine and a solid choice for a weeknight or whenever you just want something to soothe an irritated mood. categories / "France", "cote du rhone", "grenache", "syrah", "value", "wine"